Kill List is the second feature film from UK director Ben Wheatley (Down Terrace). It premiered at the 2011 SXSW Film Festival, and was nominated for several British Independent Film Awards, winning one for Michael Smiley's Best Supporting Actor Performance. This one's a difficult review to write. First of all, Kill List is best seen knowing as little about it as possible. Secondly, while it's the most intense and refreshing horror/thriller I have seen in a long while, it's also one of the most frustrating. It starts off with the same low key approach to dialog and story flow as in Wheatley's debut film Down Terrace. A great technique which quickly gives us a picture of who these people are by observing their natural interaction, instead of wasting time on prologues or spoon-fed exposition. Dropped right into the middle of the characters lives, we have to watch and listen attentively to the naturalistic dialog to pick up the story details. Fortunately all of the actors are excellent, and while some might have issues with understanding the mumbling or accents at times, the chemistry shared by the three leads, Neil Maskell, MyAnna Buring, and Michael Smiley, is completely natural and believable. Wheatley again employs most of the same technical crew, and it's evident that they work very well together. The cinematographer is Laurie Rose, whose constantly hovering camera is almost always kept at an intimate distance to the action, and her frequently off centered framing suggests an uneasy voyeuristic feel. The crisp streamlined editing by Robin Hill also maintains this feeling by using no unnecessary closeups or cutaways, and putting in a few jump cut sequences to good effect. Adding to this atmosphere and creating a real sense of dread is an incredible musical score composed by Jim Williams, comprised of low droning hums, sinister sounding instruments, and nearly inaudible demonic voices. All of which convey the palpable and inescapable feeling that something very bad is about to happen. The amount of tension built up from the use of these amazing soundscapes is truly remarkable. At this point I'm stuck, because I can't really go into detail about what I loved about this film, or even what I didn't like about it without revealing massive spoilers. All I will say is, I had some issues with the writing, but found it to be an overall impressively directed film. One which avoids all cliches, and delivers a final act that managed to evoke an intense feeling of terror and surprise in me. Something that I didn't think genre films were still capable of doing. 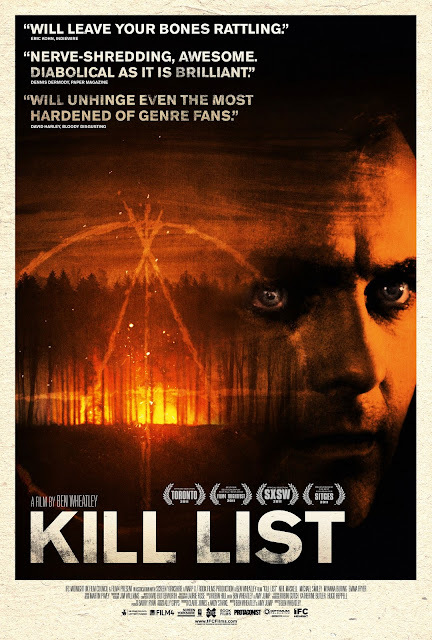 For that reason, Kill List gets my highest recommendation, and I already can't wait to see what this team comes up with next. I often feel the same way as you about overwhelming critical darlings, and wonder what everyone has been smoking, but not this one. Wow, I thought this was a mishmash of BS. And that ending. People found this intense? How some are panegyrically hailing this as a great film this is utterly beyond me. Hell, even the score is utterly monotonous half way in. Is there a place I can look up all your 5 starred reviews? Nice, I look forward to reading your rants on it. That's cool AV I know a lot of the time my obscure posts don't invite much discussion, but I do appreciate you reading them. When you say as little as you just did, and still say it's worth watching, I get ridiculously curious. And that feeling of terror and surprise? I really hope I get that. I remember the rush I used to get when I was 12 watching a thriller, and I'd really like to go somewhere near that again. Good plan. It really is best going into this one blind. Chasing that feeling is the reason I keep watching horror/thrillers, and it's films like this one that make slogging through the countless disappointments worthwhile. Thanks Dan. Refreshing is exactly what it is. Nice write up of one of the few films that got a full 5 STARS over at our gaff!! That looks damn good. And an 8.2?? Although I looooove reading your reviews of movies I haven't seen (which is a LOT), I really wish I could comment more. Maybe I'll come back when I see this one. I'm really looking forward to seeing this one. I had to read the review in bits as I don't want to know too much but the opening three paragraphs and the score is more than enough to keep my interest. http://www.top10films.co.uk/archives/9777) and agree that it is as impressive as it is infuriating. But it is refreshing to see a horror film, that admittedly doesn't shy away from its influences, taking itself seriously and avoiding predictable plotting that plagues so many genre films today. This will be in my top ten of the year. It's so good to see the praise this film got from people other than me! Especially one with such good taste as you. This is how out of touch I am, I know nothing of a new Ben Wheatley project. Ouch. Shame on me. I hadn't heard about it either until it screened at Cannes in May. To mostly bad reviews, but that doesn't affect my desire to see it. He got to go to Cannes, that's a huge step for him whether it was liked or not is not as important. True. Though it was only the Directors' Fortnight, not part of the official festival, but still I'm sure most upcoming filmmakers would kill to be a part of it. I just watched this and, well, it wasn't good. Myanna Buring is pretty and everything, and the Eastenders-style/Essex boys/mockney gangster stuff is okay for a certain demographic, but it's only a poor man's version of "The Wicker Man" at the end of the day. More importantly, while I'm here, I think you need some kind of navigation on this blog for films from each country. I'm going through a Spanish phase right now and can't find an easy link to see what you've reviewed. If you've already got such a thing other than in the labels, I can't see it. Good idea, Dr Blood. As of now, there's only the labels to go by, but I will work out a better system when I get some time. Thanks for the suggestion, also thanks for sharing your thoughts on the film. Maybe some little flags of each country arranged in a grid would be easiest. Just an idea.